It's a busy weekend on the XTERRA World Tour with three majors - the XTERRA Guam Championship and XTERRA Costa Rica on Saturday, and the XTERRA Great Ocean Road off-road tri in Australia on Sunday. Honolulu, HI (March 27, 2014) – It’s a busy weekend on the XTERRA World Tour with three majors – the XTERRA Guam Championship and XTERRA Costa Rica on Saturday, and the XTERRA Great Ocean Road off-road tri in Australia on Sunday. There are several great match-ups to look forward to, highlighted by the Leonardo Chacon vs. Josiah Middaugh showdown. Chacon, an Olympian from Costa Rica, ran past Middaugh in the final stretches of the XTERRA USA Championship in Utah last year to take the title, and there is no doubt Middaugh would like to return the favor on Chacon’s home turf. “Leo is undoubtedly the favorite, but since he beat me on my turf at altitude, I would like nothing more than to return the favor in the heat and humidity. Since nothing about my winter training could prepare me for hot and humid, I am feeling very optimistic,” deadpanned Middaugh from the midst of a blizzard in his hometown of Eagle-Vail, Colorado. The race is scheduled for a live broadcast starting at 7:45am MST on Saturday. Access the video link from costaricaxterra.com. Images and results will also be available through their Facebook page. The first XTERRA in Costa Rica was in 2006 and while it was nice, it did not last. One might say we were eight years ahead of our time. For this edition there are already 258 entries and 20 teams for the two distances. The location is on the west side of this Central American country on the blue Pacific, with headquarters at the very posh and luxurious Reserva Conchal which has hundreds of great condos, a grand Westin Resort and a full championship golf course as its focal points. No more than a few minutes away are campgrounds and very inexpensive small hotels, literally everything from $25 a night to $400 a night and all in between. The swim will be a typical XTERRA 2-lap with short beach run. Today the wind was at least 20 mph with gusts even higher. Forecast says that will die down on Friday. The ocean currents are changeable and we’ll decide the direction, clockwise or counter, based on what Mother Nature gives us. Transition is a short beach run away and is there for both bike and run. The first few K of the bike are tough. Some really, really, really steep climbs in the first 3K and our advice is to play it easy until you get over these hills and save your power for the rest of the course. A great combination of dirt roads, gravel, lava rock, some single track but mostly loose brown dirt trails. There are some technical downhills and more short, steep and loose climbs that many will choose to walk, especially near the end. We’re driving 4WD vehicles on as much as we can to pack some of the trails down. There just has not been a lot of rain recently. A good set of eyes and experience will have a lot of benefit in finding the packed line around much of the course. Back at the beach transition and out on the run you’ll find it much flatter and fast, but don’t let the elevation profile kid you, that first climb is not so bad – even I can run it! There are two loops inside the Reserva and as it should be – some beach running near the finish. We’ll start early, 0645 to avoid the heat of midday. Costa Rica is a pretty amazing place. We had breakfast with a couple Iguanas’ one of which was over 2-feet long. Another usual sight are these fat, furry animals that are a cross between a raccoon and an anteater called a Pizote. Lots of howler monkeys out in the morning and late afternoon hanging out in the tree tops and noisy birds deep in the forest. I hope to get out a bit further into the bush in the next day or two to see what else is there. A big pro field here headlined by the very fast Costa Rican Leonardo Chacon. Also from Costa Rica, Rom Akerson is making his return to XTERRA after a few years off and if he is back in form, Rom can be very fast. From the U.S. we have The Champ Josiah “Beast Mode” Middaugh with Branden Rakita and Craig Evans. Shonny Vanlandingham and Suzie Snyder are here for the Luna team along with Christine”Big Fish” Jeffrey. First year pro from Mexico and future superstar Mauricio Mendez has made the trip and it will be interesting to see if he can continue his unbelievably quick age group finishes as a pro. Toss in Brits’ Llewellyn Holmes, Brazil’s Laura Diaz, Italy’s Simone Calamai and Fabrizio Bartolin, Sebastian Neef from Germany and hopefully Jan Kubicek from the Czech Republic and we have one great field for the first year. We also have a strong over 75 age group with a current and former World Champs Ron Hill versus Nat Grew in the field. Many-time XTERRA champion Kerry Classen is living in Costa Rica and we’re trying hard to get him off his bar stool and back in the water. He says no, but I think he’ll be on the line come Saturday morning. While the 2005 “Xticer” may not have been an official XTERRA (don’t tell that to Art and Annie Guerrero – the champions on that day) the Live More spirit has been strong in Guam even longer than a decade, ever since the “Guamaniacs” first rallied to travel and support XTERRA Saipan back in 2002. It’s an epic course with island weather that is as warm as the people. For more on the race and the pros competing we turn to Charlie Epperson, a Guam-based rookie pro who recently finished 4th in his elite debut at XTERRA Philippines. XTERRA Guam is celebrating its10th anniversary of racing this year and the international field of professional racers is one highlight of this storied race. In 2010, XTERRA Guam was named one of the Top 5 off-road races in the world by Triathlete Magazine, although many of the local triathletes were already well aware of the beauty and challenge our course has to offer. The growth and prestige of the race has grown each year and with a new XTERRA Asia-Pacific Championship race held in New South Wales, Australia in late April along with the $50,000 pro prize purse, it is now more financially appealing to professional racers to travel to our region to race. Known as the Swiss Miss, Renata Bucher returns to Guam for her fifth time. Winning individual titles in 2010 and 2012, last year, Renata took second to Slack in a close race. Renata is on fire recently capturing her first title of the year at the 2014 XTERRA Philippines. With 32 individual titles under her belt, Renata is one of the most successful female racers in the history of off-road triathlons. In 2014, Renata launched a new project, ALOHA RACING TEAM, which promotes off-road and road triathletes from around the world. As team manager, Renata is responsible for securing top of the line sponsors that equips their athletes with the best gear available to compete against the world’s best. A few of their sponsors so far: Storck Bicycles, Magura, Coeur Sports, Catlike and Sram. Mieko won XTERRA Guam twice in 2008 and 2011. In 2013, Mieko also captured the XTERRA Japan title, her fourth, and finished runner-up in XTERRA Malaysia. Mieko is a fixture in the local racing scene and has already captured the Tour of Guam (cycling) and Bank of Guam 5k (running) titles for the year that each came with a big payday. At XTERRA Philippines this year, Mieko showed off her strength by running down third place on an extremely hot day. Her efforts allowed ALOHA RACING TEAM to take 1st and 3rd on the podium that day. After XTERRA Guam, Mieko will return to her former home in Saipan to race and eventually onto Australia for the XTERRA Asian-Pacific Championship race. Carina started the year off in South Africa at the XTERRA South Africa Championships where she secured a second place finish to add to her victories in 2009 and 2011. Not afraid of a long flight, Carina found herself in the Philippines battling for the win against Renata Bucher that was only decided over the last 200 meters of the race. Carina has raced in Guam and Saipan the last couple of years and is expected to be in the hunt for the Championships this year. When Carina is not racing the traditional off-road triathlons, she can be found back in her home country of Austria racing the Winter Triathlon circuit that includes a snow covered run and bike course before clipping in snow skis for the final leg of the adventure. In 2009, Carina won the ITU Winter Triathlon Championships held in Austria. Dan is widely recognized as one of the best and most consistent off-road triathletes in the business. In 2013, Dan finished runner-up to Ben Allen at XTERRA Guam before going on to win a number of races including the highly contested XTERRA East Championships in Richmond, Va and dominating the XTERRA Japan Championships. As for 2014, Dan has been on a streak and claiming titles at XTERRA South Africa and the XTERRA Philippines held in Cebu. Dan spent his off season back in Stellenbosch, South Africa tuning up for a long year that will see him race in the Philippines, Guam, Saipan, Las Vegas, Australia, Malaysia, Sweden, Denmark, Norway, and a return to the USA before the year is complete. Dan can be found on the cover of the January edition of TRIATHLETE magazine proving great exposure to his sponsors that include PUMA, SPEACIALIZED BICYLCLES, and OAKLEY to name a few. Bradley is the training partner of Dan Hugo and is based out of Stellenbosch and Boulder, CO although he would consider himself a Capetonian (originally from Cape Town, South Africa). Weiss is part of the younger generation of XTERRA triathletes that are poised to make an impact and to raise the bar for the sport. Bradley captured the ITU World Championships U/23 title in 2012 as part of the XTERRA Southeast Championships in Pellham, Alabama. This win put Bradley on the map and demonstrated his commitment to the sport and ability to race at the highest level. With countrymen such as Dan Hugo and “the Caveman” Conrad Stoltz, Bradley has a long legacy to uphold as a South African Triathlete. So far 2014 has been a breakthrough year for Bradley who held strong at XTERRA Philippines to finish runner-up to Hugo and is looking to continue the success here. A strong swimmer, Bradley should set the early pace and be in the hunt as riders roll into T-2 to begin the signature run. Nico is a late entry into the XTERRA Guam and serves as the final member of the South African trio. An ITU Olympic distance specialist, Nico has done his fair share of off-road racing. In 2012, Nico won the South African Tri Cross National Championships and went on to finish 17th at the World’s held in Pelham, Alabama later that year. This will be Nico’s first time racing XTERRA Guam, but his strong swim and mountain biking experience should allow him to compete well against the international field. If you get the opportunity to chat with Nico don’t be afraid to talk training, Nico serves a professional coach and may be able to offer you some free advice. Michal got his start in professional racing as part of the Slovakia National Canoe-Kayak team. As part of the training for the National Team, they were required to run, swim, and cycle during the off-season, so the transition to triathlons was only natural. Michal has been an active racer in the Asia-Pacific region mostly racing road and 70.3 distances. As a two-time Kona Ironman World Championships finisher and 70.3 World Championship competitor, Michal has the endurance to race with the best in the field. Michal began his off-road PRO career at this year’s XTERRA Philippines and was positioned well to finish in the top-3 if a broken chain didn’t derail his chances. An optimistic racer, Michal had a smile on his face throughout the day. With over 50 Age Group victories from 2005-2013, Michal has the experience and fitness to make an impact in this year’s race. Markus is coming off a strong 2013 campaign highlighted by finishing 15th in the European Cross Triathlon Championships as well as a respectable 22nd in the ITU World Championships held in The Hague last July. Markus has made the most of this exotic destination race by bring his wife and traveling to Yap for a diving adventure between training sessions on the XTERRA Guam course. Markus (pictured in the Red Jersey) is seen with his fellow Nora Racing Teammates. One of the youngest competitors in the pro men’s field, Oliver is far from a novice. As the 20-24 Age Group Champion at the XTERRA World Championships in Maui in 2012, Olly has a ton of racing experience under his belt. Olly has made a successful transition to the PRO ranks and raced throughout Europe last year gaining valuable experience. Additionally, Olly found the time to race in the highly competitive field at the 70.3 Ironman Asian-Pacific Championships held in Auckland, NZ where he was again crowned 20-24 age group champion. As one of the two Kiwi professionals making the trek from Rotorua, NZ, a mountain bike heaven and host to their own XTERRA New Zealand Championships race. 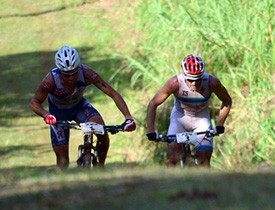 As the 2013 NZ Elite Cross Triathlon National Champion, Olly has the skills to race the best at XTERRA Guam this year. Known as “Oga” to his friends, this will be his 6th year in a row racing XTERRA Guam. After finishing runner-up to Sam Gardner in 2011, Oga will be looking to make the podium in this extremely stacked male field. Oga has been a member of the Japanese Mountain Bike National Team an amazing five times and can lay down one wicked bike split. I had the benefit of coming out of the water ahead of Oga last year at XTERRA Guam- only to witness his MTB strength as he blew past me climbing Nimitz. In 2012, Oga captured the XTERRA Japan title alongside hisgood friend Mieko Carey. In past years, Oga has raced both XTERRA Guam and XTERRA Saipan to take advantage of the quick flights and proximity to Japan. If Oliver Shaw is the upcoming New Zealand triathlete then Mark Leishman is recognized as one of New Zealand’s most consistent riders and triathletes over the last decade. Known as “Cabin” in the mountain biking scene of NZ, he has been selected to both XC and Marathon World Championships teams. An avid racer, Cabin has finished on the podium at the XTERRA New Zealand Championships ive consecutive years from 2007-2011. Demonstrating a wide-range of ability, he has claimed the Oceania Short Track title and finished 4th at the Singlespeed World Championships in 2010. Cabin arrives to Guam ready to turn a big gear on a course that favors strong mountain bikers. I wouldn’t bet against this Kiwi making the podium at XTERRA Guam on his first try. Tyce has been a fixture in the racing in Saipan for many years. A multi-talented athlete, Tyce is probably most recognized as a beach volleyball player, a sport that sent him to the Pacific Games as a representative of the Commonwealth of Northern Mariana Islands (CNMI). Not afraid of a challenge, Tyce has partnered with former fellow CNMI resident Mieko Carey to win the Guam Endurance Adventure Race (GEAR) that can last well over 24 hrs. Tyce has raced XTERRA Saipan for a number of years, but this will be his first attempt at racing XTERRA Guam. Tyce is well acclimated to the climate of Guam and CNMI and should have no trouble battling through the conditions. Coming off a beating at the XTERRA Philippines Championships in Cebu, I was unexpectedly not prepared for the heat that defined the run leg of the course. Looking forward to the cool waters of the XTERRA Guam run course, I’m stoked to race on my home course in my second attempt in the PRO ranks. I’ll make no predictions on how I’ll fair under this stiff competition, but I do feel confident I can smash my times from previous years. With a solid year of training that was defined by no significant injuries or loss of training time, I’m likely in the best shape of my life at the not-so-youthful age of 37. I’m lucky to have a solid training group here and look forward to a year of traveling and racing that will take me to Saipan next and then back to the US to race in my college town of Knoxville, Tennessee for XTERRA Knoxville. I will finish my year of XTERRA racing at the XTERRA East Championships in Richmond, VA that will double as the USAT Off-Road Championships alongside a large contingent of Guam triathletes. The second-running of the XTERRA Great Ocean Road triathlon takes place Sunday at the Anglesea River-mouth Park in Anglesea, Victoria, Australia. Up for grabs is $15,000AUD prize money for pros and 15 spots into XTERRA Worlds for amateurs. The event will also double as the Victorian Off-road Championships. Ben Allen – from Wollongong, New South Wales, Allen follows the XTERRA Series around the globe. Allen won seven XTERRA World Tour races last year, and was second to only Courtney Atkinson at XTERRA Great Ocean Road last year. Eddie Sturla, Argentina, currently based in Australia – a triathlete for over 24 years, Sturla was the first South American athlete to win an Ironman competition at Ironman Brazil in 2001. He placed in the top 10 at the Ironman World Championships held in Kona, Hawaii in 2008. Sturla is now venturing into the world of off-road adventure. This is his first XTERRA event. Roger Serrano, Spain – Spanish Triathlon Cross Champion 2012 and sixth place at the XTERRA Spain National Championships 2013. Drew Box, Australia – from Kallangur, Queensland, 45th place in ITU World Triathlon Stockholm (Elite Men) and 36th place ITU World Triathlon Madrid (Elite Men) 2102. First XTERRA race. Jacqui Slack, England – Won six XTERRA World Tour races last year, including the British title and the Triple Crown. Was second at XTERRA Great Ocean Road last year to Renata Bucher. Peri Gray, Australia – Anglesea local, second year XTERRA pro. Fifth at XTERRA Saipan, sixth at XTERRA Guam, sixth at XTERRA Malaysia and fourth at XTERRA Great Ocean Road last year.